There are some who will wonder why we do it… we spend hours building a layout and its rolling stock to then transport it miles around the country, set it up, intensively operate it then pack it all away again and transport it back home. No matter how careful we are some damage will inevitably occur to something along the way. The reason why I do it, is for the enjoyment of exhibiting something I have built, have fun operating the layout with my family and friends and to meet a wide range of fellow modellers, many of whom have a common interest in all things Southern, and it is great that they take the time to show an interest in what I have done. Last week Fisherton Sarum was at the excellent Watford Finescale exhibition, amongst a very high calibre of other layouts, it was a very enjoyable weekend. I met and chatted with a number of readers of this blog and it is always great to see you. As the title of this post implies there was a couple of casualties at the weekend, which is something I come to expect and do not generally get too upset about, some things get fixed / replaced on the spot such as wires coming adrift or couplings breaking as it is necessary to keep the layout working. Others such as physical damage (although amazingly a once dropped locomotive only suffered a broken coupling that was fixed on the spot), broken detail (even when trying to avoid handling stock as much as possible), failed locomotives (although they all get cleaned and tested before each show) get put to one side for fixing at a later date. One of my signature rakes is the Meldon Ballast train of SR diagram 1774 40T bogie hoppers, made from modified Lima Sealion wagons. These were fitted with Ratio diamond frame bogies (as they were the only ones of the type available at the time) and over time have proved to be quite fragile due to their method of construction and last weekend I was down to only 4 of the 8 usually in service. I have now this week had a pleasant evening replacing the damaged bogies with replacements from Cambrian Models, these comprise of a single piece moulding for the bogie itself which should be far stronger in exhibition service, and I am now back to a full rake of eight 40T hoppers. Although such damage is / can be frustrating it is all part of the hobby when exhibiting and does mean a little extra time modelling to put things right again but sometimes this can result in an improvement to the models such as the case of the Cambrian Models bogies. 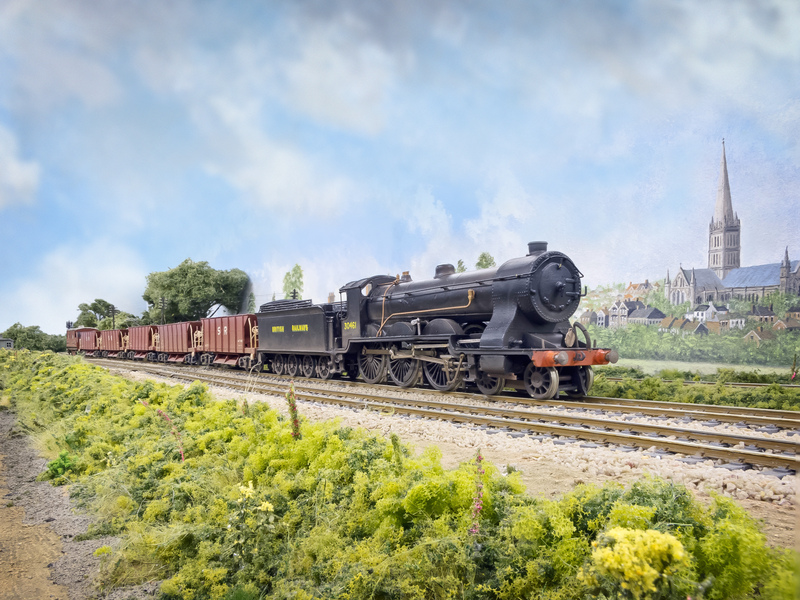 Fisherton Sarum will once again be hitting the road on 8th / 9th March 2014 for the Basingstoke and North Hampshire Model Railway Society show being held at the Aldworth Science College, Basingstoke, RG22 6HA and if you are popping by please say hello as it’s always nice to chat. I too am very much looking forward to the Wilton show and as you say meeting you at long last. See you then. Thanks for your comment and I couldn’t agree more.